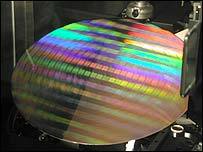 Moore's Law, the guiding principle that has driven the computer chip industry, celebrates its 40th birthday this week. The "law" was adopted after Intel co-founder Gordon Moore wrote in a 1965 article that the number of transistors on a chip would double every 24 months. 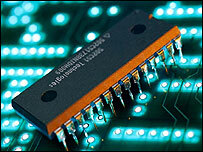 Chips that can work faster and faster have driven the technological and digital revolution so far. Dr Moore said that the next 40 years could be "mind-boggling" and that he wished he could be around to see it. "I re-read my 1965 article a year or so ago, and I frankly was surprised to see in it that I had predicted home computers as one of these uses for low-cost electronics, but had no idea what it would look like," he told the BBC News website. "I said 'gee that's fine but what would you use it for?'. "The only application he could think of for it was the housewife putting her recipes on it, and I didn't think that was going to be a powerful enough application." Calling from Hawaii to speak to journalists, the retired pioneer said the chips that drove electronics now were so much more capable because competition between chip makers had pushed progress. But, he added, interfaces and software on computers and gadgets had to get easier to use as the capability of technologies continued to grow. The law was never one of physics, but rather a prediction about how complex integrated circuits would become, which appeared in Electronics magazine on 19 April 1965. The original copy of the magazine, which is now defunct, cannot be found. Intel has reportedly offered a $10,000 (£5,300) reward on eBay for a copy in mint condition. Dr Moore's proposition was that systems were going to get much more complicated than they were, and that integrated circuits would be the way to keep costs of electronics down. 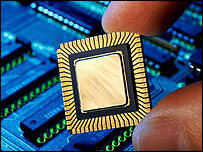 "Integrated circuit" is the term used to describe the collection of interconnected transistors, diodes and circuits on a piece of semiconducting material - a silicon chip. When Dr Moore wrote his article, integrated circuits had 30 components - the elements that make them work - in them. The labs he worked in at the time had one with 60 components. "I looked back at the few preceding years and saw that we had about doubled every year. "I took this doubling every year and extrapolated it for 10 years to say the complexity of integrated circuits would go from 60 to something like 60,000 on a chip. He said it had been a "pretty wild" extrapolation, but one that he hoped would be accurate and that would push prices down. "I frankly didn't expect it to be at all precise. But in fact it turned out to be much more precise than it had any good reason for being, and one of my colleagues dubbed it 'Moore's Law'." Without chips which continually improve their performance and shrink in size, mobiles, PDAs (personal digital assistants), game consoles, laptops, and digital music players, that are such a part of many people's lives, would not be as sophisticated. But there are limits to how much can be fitted on to chips effectively, and Dr Moore predicts that his law has about 10 to 20 years before a fundamental limit is reached. There are also problems with pushing to increase performance while at the same time trying to limit problems of power leakage and reducing heat levels that rise as more circuits are crammed into an ever smaller space. Researchers all over the world are looking to quantum computing and nanotechnologies to find alternatives for silicon-based chip technologies. But Dr Moore said he was sceptical about efforts to replace components with technologies and materials developed at the nano-scale. "Nanotechnology is a very broad field with a lot of applications but I am sceptical that it will replace the more standard silicon technology in the mainstream," he said. "We are already operating at well below 100nm which is the conventional boundary for nanotechnology. But the general idea of building things up atom by atom from the bottom comes from a different direction." He added: "There is a huge difference between making one tiny transistor and connecting a billion of them to do something useful."